Business lease law is regulated primarily by the Lease of Land Act 1969. A lease of up to ten years does not have to be registered. 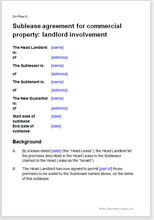 If the term of this lease is longer than ten years it must be registered at the Deed Registry Office. A sublease carved out of a registered head lease should itself be registered.